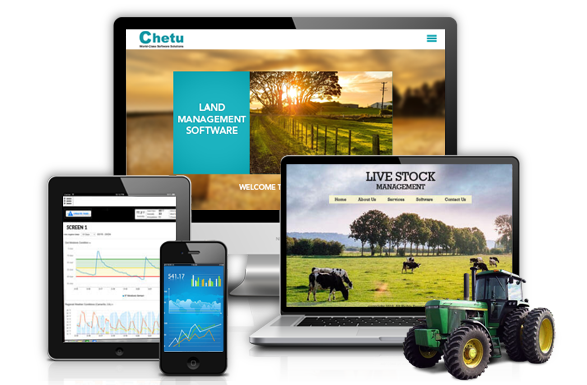 Put advanced analytics and data to work for your livestock management operation, thanks to Chetu's custom software. Plan finances, breeding, grazing and record keeping to the most optimal level possible. Our livestock software specialists develop custom platforms for centralizing all operations related to cattle management, as well as poultry, horses, and other dairy herds. We build native and cross-platform mobile apps with full access to the management platform and the ability for users to scan ID tags and pull up animal specs with one click. We program modules for animal and breeding tracking, ranch management, accounting, and more. We build custom dashboards for tracking herd-wide propagation and gestation statuses. We configure Decision Support Systems (DSS) to help optimize operations for reducing breeding costs, producing quality offspring, and identifying underperforming stock. Integrated user portals interface with livestock auction systems for publishing detailed genetics information, pedigree, fertility history, and other critical stats. Our specialized database management solutions enable ranchers to view and edit data (pedigree, origin, health stats, pending events) on every animal in the herd from any desktop or mobile device. We build mapping interfaces for tracking livestock locations, leveraging Radio Frequency Identifiers (RFID), Electronic Identification Devices (EID), embedded ear tag sensors, and third-party GIS/GPS software. Our financial planning software is integrated with Business Intelligence (BI) engines for calculating animal and herd values according to factors like breed, pedigree, location, age, and market conditions. We create custom report generation tools for visualizing key performance indicators for each animal, herd, or other custom-defined group and sharing those reports with shareholders. We develop pasture and grazing management software solutions to record and optimize individual field yields and annual pasture growth. We program pasture mapping apps with Geographic Information Systems (GIS) and geo-fencing technology for generating detailed field views and planning herd movements. We also interface with weather tracking systems that alert users when herds need to take shelter. We develop feed management software platforms for determining the optimal nutritional intake for individual animals and groups, as well as testing batches, planning feed schedules, automating ingredient reorders, and managing facilities (including security and energy usage). We use audit trail software to maintain supplier-level traceability and ensure Veterinary Feed Directive (VFD) compliance.